OK so maybe the title is a bit too cute but it was suggested I try and balance my focus on highly technical stuff with a little bit of lighter stuff. Well air is light, isn’t it? Today’s key points: Know the minimum tire inflation based on manufacturer estimates. Check your inflation with a good gauge at least monthly and every morning before travel. Tire inflation seems to be a topic that confuses some and has others believing in misleading or just plain incorrect information. Tire inflation is one item that directly affects the safety of your RV, truck or car as you travel down the highway. Many of my previous posts have been background information that you really don’t have to know or fully understand. The intent of these topics is to give you a better foundation of understanding more about tires but, if you only pay attention to one series of posts this is it. Tires do not carry the load. They are just a container of air. It is the inflation air that does the work. Think for a moment of an impact wrench. It can’t do the work of loosening or tightening nuts on your wheels without the air, and a tire can’t do the work of carrying the load or provide the traction needed to turn, start or stop if it doesn’t have air. The load a tire can carry is based on the air volume of the tire and pressure of that air inside the tire. If you want to get a feel for how little load your tire can carry without air in it, you can test this yourself. Simply take an unmounted tire and stand on the beads of the tire. I think you will find that the tire can support less than 5% of the rated load before it deflects more than an inch or two. Some people believe that tires with higher load range can carry more load at the same inflation. This is just not correct. You would be hard pressed to measure the uninflated load capability difference between a load range D and E tire or between a G or H load range tire. If you are not sure, the "Load Range" is marked on the sidewall of your tires. If you don't see the words "load range" look for "LR" followed by a letter usually between C and G. "Load Range" may not be in large letters but you should be able to find them on your tires. The simple answer to how much air you need is on your data sheet. Depending on the year your RV was made, this information is on a sticker on the side of your trailer or near the driver’s seat in your Class-A or glued to the wall inside a cabinet or on the inside of your entry door. Where ever it is, you should also have the information in the stack of owners manuals you received when you bought the new RV. Find this data sheet and write down the information for loads, minimum inflation, tire size and load range and place this info where you can easily find it. This inflation is the minimum based on what the RV manufacturer thought you would load into your vehicle. They may have guessed correctly or you may have gone way over that estimate depending on how much “stuff” you carry. Our next blog will cover how to know the real load on your tires and what you need to do to be sure you are nor overloading your tires, wheels, axle or RV. I gotta start off by telling you something my wonderful wife Nancy says bout me. If you ask me the time of day, I may end up trying to tell you how to build a watch. I've decided I will try to start some of my posts with a one paragraph summary. If you want to know more then you can read on, but you have been warned. 90+% of RVs should have bolt-in metal valves and it won't hurt if we used them even on a Tear-Drop trailer. Rubber valves on your car should be replaced whenever you get a new set of tires. The rubber gasket part of metal bolt-in valves should be replaced whenever you get new tires. If the valve core is leaking, replace it. OK now for those that want the details. 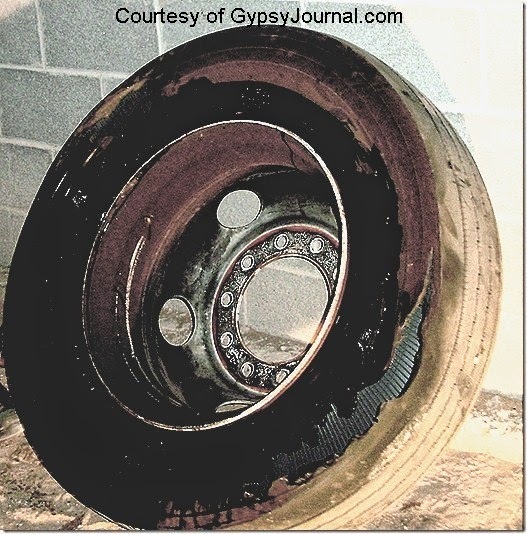 Recently a friend, Nick Russell, the editor of Gypsy Journal had a tire failure. This was an inner dual and you can see right through the tire sidewall where a big chunk is missing. While some would blame the tire and say it was defective and that he had a "Blow-Out". Nick is a bit smarter than that. He knew he had been having problems with air leaking out but there was no puncture. The "Root Cause" of this failure was traced to the use of a rubber valve on his Class-A size tire. The valve stem did not seal properly and he had a slow leak. The end result of someone trying to save a couple of bucks cost Nick over $700 for the service call and new tire. Standard rubber valves like the T-414 series are rated for a MAX of 65 psi and for use on the relatively thin passenger rims. There are rubber valves such as the 600HP rated for a MAX of 100 psi but neither of these "snap-in" rubber valves belong on an RV with the possible exception of some very samll trailers and some Class-B units that use standard passenger tires. Class-A, Class C and most trailers have inflation pressures that exceed 65psi with many above 100psi so a bolt-in metal valve is the only one to use. It is important that the tech doing the installation of these bolt-in valves apply the proper torque. Small bolt in valves such as TR-430 use 25- 45 inch-pounds of torque. The majority of the TR-500 series use 80-125 inch-pounds. If you discover the valve core is leaking don't just crank it tighter like you would a leaky water faucet. All the core needs is finger tight. 1.5 to 5.0 inch pounds MAX. If you over-tighten the core, you may split the core gasket (black in the graphic) and it will just leak more. If you look at the graphic from Schrader you will see the part that that lets the air in and out can't be tightened. Your tire dealer should be willing to give you a new valve core for free. You should ALWAYS use some type of cap with metal the best. The primary purpose of the cap is to keep dirt out but a good metal cap with internal gasket can keep most of the air in too. Watch THIS little graphic on how a valve core works. A final bit of warning. On your car you may have a Tire Pressure Monitor System. Most of these are Aluminum not Brass so they need special stainless steel valve core and they may be bolt in and have low torque requirements. If you need to service the OE TPMS valve you need to go to a car or tire dealer as they have the correct tools. I will be covering TPMS as a separate topic in the future. If a tire is being designed for a specific vehicle manufacturer such as Ford, Chevy, Toyota, or BMW, there will be a number of tires submitted by competing tire companies all trying to deliver the best overall compromise in performance characteristics. Please note than all original equipment vehicle manufacturers have slightly different requirements but all make similar requests for performance improvements in many areas. In the future I will use the term "OE" to include these car and pickup manufacturers. Compromise: Now is a good time to talk about some of the various trade-offs the engineer is faced with when trying to meet conflicting goals and customer wants. I am sure we would all like an RV that has all the interior space and amenities of a 40’ diesel pusher but gets 25 mpg and can be driven down crowded city streets without knocking off our mirrors. Oh yes, it should also cost under $30k. Well Bunkie, that just ain’t gonna happen in real life. The same goes for a tire that handles like an Indy tire, is as quiet as the proverbial mouse, has great off-road traction, is good for 100k miles, and costs $25. One thing few people realize is that most if not all performance characteristics are a compromise. For example: if you improve wet traction you probably hurt fuel economy unless you use a special type of rubber that costs double per pound and is more difficult to process. If you improve handling you might hurt ride and noise. When you improve noise you can significantly increase the cost of making the molds used in manufacturing. The cost of a tire mold can be as low as $10,000 and can approach $100,000 each. 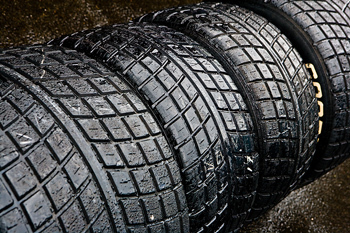 Depending on the production volume needs, a tire manufacturer could need 30 or more molds. The list of trade-offs goes on and on. The competition for a tire application might start three or more years before scheduled start of delivery with two to five tire manufacturers competing for the contract, knowing that only one or two will end up being selected to actually provide tires. The costs associated with building and testing special prototype tires can run in the hundreds of thousands of dollars and are absorbed by the tire company. The only way a tire company can afford this type of activity is by landing a contract for a few hundred thousand tires so the costs can be spread out. Unlike “OE”, an RV manufacturer may only need a couple thousand tires so a custom tire, designed for a specific RV would be cost prohibitive. Since the RV manufacturer won’t be trying to get custom tires, it doesn’t have staff engineers working on developing specifications for such tires. The RV company will in all likelihood either take what comes already on the cut-away chassis or the bare chassis for Class-C or A vehicles and in the case of trailers, may buy the tire with the lowest cost that can meet tire size requirements and expected delivery schedule. For RV applications the one thing that is in the control of the manufacturer is “Reserve Load”. This is the difference between the load placed on each tire with the RV normally loaded and the load capability of the tires at specified inflation. Before we cover tire manufacturing -- perhaps dull to you but interesting to me -- we will do our first post on tire loading. I say first, as this topic is the single most important performance characteristic for we RV owners. But few of us truly appreciate the potential safety issues involved. Tire design goals: what are they? Usually a sales and marketing department decides they want a new tire design or size based on expected needs or wants of customers. The customer can be the end retail buyer or in some cases a vehicle manufacturer. If it is a vehicle manufacturer such as Chevrolet, Ford, Toyota or any other car or light truck manufacturer, they will have a long list of performance characteristics they want for their new vehicle. Some of these will include measurables such as weight; high speed capability; wet, dry and snow traction; noise characteristics on different road surfaces; ride characteristics also on different road surfaces; rolling resistance (fuel economy) and of course pricing, quantity and delivery volume rates. Since most Class C motorhomes are built on what is called a “cut-away” van chassis, the list will have many but not all of the same type of performance measurements, albeit with different numbers. It is important to remember that when a van chassis is designed the manufacturer does not know if the vehicle will be used as the base for an RV, ambulance or delivery truck. So the tires are normally not specified to provide performance specific to a certain type of vehicle, but a compromise for use on all of them. Class-B motorhomes basically use regular delivery vans which are modified with RV features. If the vehicle manufacturer makes a heavy truck chassis like those under Class A motorhomes, their list is much shorter and may only include a couple of characteristics. In some cases they will select a tire from existing production so the only details to be worked out are pricing, quantity and volume delivery. Travel trailer manufacturers usually select tires that meet the expected load capabilities of the trailer and purchase in bulk from existing inventory. NEXT TIME we will cover the process of taking a tire design from concept and “wish-list” as we turn it into a prototype. Later we will cover manufacturing then we can move on to performance, tire care and maintenance and finally tire problems. We all have them. We all use and need them. But most would prefer to never have to think about them. As a Tire Design and Quality Engineer, I am one of the few that actually like tires. While I doubt that I can change your feelings about tires from dislike to liking them, I would hope I can at least get you to better appreciate what they do and why with just a little care you can get many useful years of service from the tires on your motorhome, truck, trailer or car. It is important that we all have a basic understanding of what a tire is or some will be working off incorrect assumptions. Let’s start with a little information on just what goes into the process of designing modern radial tires. Unless I point out something as specific to one type of tire you can assume the information presented applies to all tires used on vehicles intended for highway use. In future posts we will cover tire development, manufacturing and with that under our belts we will move on to tire failures and the probable cause or causes. For those wondering, perhaps I should give a little bit of my background. I am retired and have 40 years experience working for a major manufacturer developing tires for applications in North, Central and South America. During my career I worked on many kinds of tires -- heavy truck, passenger, light truck and Indy-car types. I hold two design patents. I developed failed tire inspection procedures and taught classed to more than 300 engineers and technicians in the tire and car industry as well as to engineers of the US Department of Transportation. I also put my tire and vehicle knowledge to use as a race car owner and driver setting lap records at six different road courses and have even taught vehicle control to police officers from a number of local towns. I have owned a travel trailer, a 5th wheel, three race car haulers (open and closed), a slide-in camper, a Class-A and two Class-C motorhomes.